Note: the Pillsbury Bake-Off is coming in November! Check out my coverage of the 45th and 46th Bake-Off, and follow the recipes posted so far by clicking the bakeoff tag below. 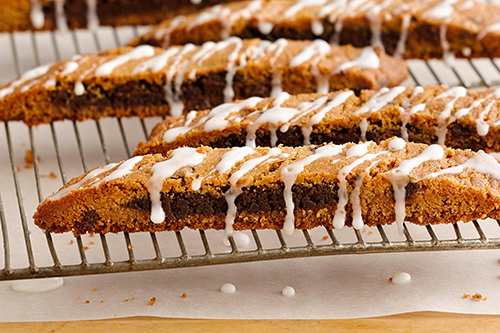 Marcia Jacobovitz of Cedar Grove, New Jersey knows what most biscotti is missing: chocolate filling! I think this is a perfect way to keep naturally dry biscotti interesting and a little moist, don't you? Good luck at the Bake-Off! Heat oven to 350°F (325°F for dark or nonstick cookie sheet). Line large cookie sheet with parchment paper. Measure 1/3 cup cookie dough; set aside. In small microwavable bowl, microwave chocolate chips uncovered on High 40 to 50 seconds, stirring once, until chips can be stirred smooth; set aside. In large bowl, break up remaining cookie dough. Add peanut butter. Beat with electric mixer on medium speed 30 to 60 seconds or until well blended. On cookie sheet, shape dough into 14x2-inch rectangle. Make a 1 inch wide by 1/2 inch deep indentation lengthwise down center of rectangle. In same large bowl, beat reserved 1/3 cup cookie dough, the cinnamon and melted chocolate chips on medium speed 30 to 60 seconds or until well blended, adding water 1/4 teaspoon at a time, if necessary, to create a dough. Roll dough into 14-inch long rope. Place rope in indentation down center of cookie dough rectangle. Bring sides of dough up around chocolate rope; pinch edges to seal. Place diagonally, seam side down, on cookie sheet. Flatten to 3 inches wide. Bake 20 to 24 minutes or until golden brown and center is firm to the touch. Slide parchment and biscotti rectangle from cookie sheet to cooling rack. Cool 15 minutes; remove from parchment, and place on cutting board. Line cookie sheet with parchment paper. Using sharp knife, cut rectangle into 1-inch diagonal slices. Place on cookie sheet 1 inch apart. Bake 10 to 13 minutes or until deep golden brown. Remove from cookie sheet to cooling rack. Cool completely, about 15 minutes. Meanwhile, in small bowl, mix powdered sugar and 2 to 3 teaspoons water until thin enough to drizzle. Place in resealable food-storage plastic bag. Cut off tiny corner of bag; squeeze bag to drizzle icing over cooled biscotti. Store covered.